As global citizens, we are becoming more aware of our impact on the environment when travelling. With travel becoming more accessible we need to make sure our trips don’t have a negative impact on the places we visit and the environment. As well as offsetting our carbon footprint we need to think about the things we bring along and what we leave behind. This means being careful about what you pack and purchase during your journey, and one way to reduce waste whilst traveling is to ditch the plastic packaging / bags. Did you know that regular plastic bags can take up to 500 years to biodegrade? Although a lot is being done across the world to reduce plastic waste, as travelers we can do our small bit too – instead of using disposable plastic bags when packing, it’s far more environmentally friendly (and a lot easier to stay organized) to use packing cubes. Packing cubes are fabric cubes which come in different shapes and sizes usually secured and fastened with a zip. 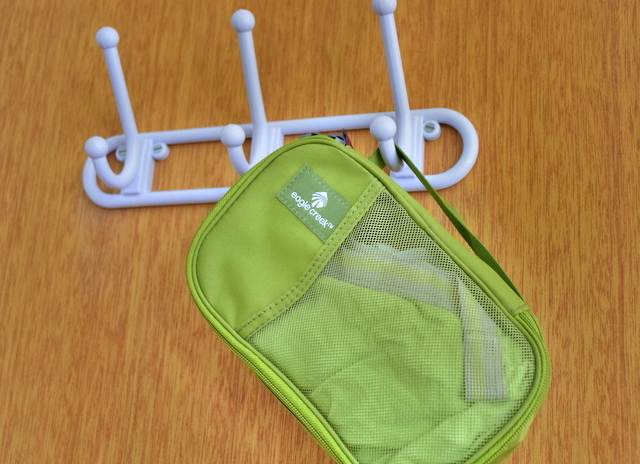 They are a great way to keep your clothes, accessories and toiletries separated and compact in your backpack whilst travelling. They reduce your impact on the environment, and mean you don’t have to travel with plastic bags. 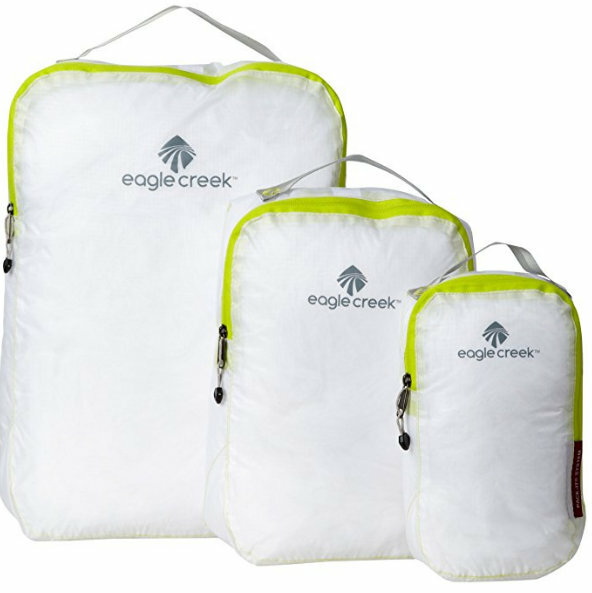 With a massive range of sets, colors, sizes, and fabrics which range from breathable to water-repellant (which holds in moisture and controls odors), we recommend packing cubes from Eagle Creek. The great thing about using packing cubes is that they can be reused again and again. The tough fabric and foldable durable design means they are strong for frequent usage and can also be stored easily when not in use. Some are waterproof too which means it protects the other contents of your backpack. If you spill anything on or soil your cubes they can be easily washed and dried, so they won’t need to be replaced. Even though they don’t cost too much, they are an investment for your travels. It’s a good idea to read travel packing cubes reviews to see which ones are best for you before you decide which ones to buy. There’s nothing worse than mixing up your clean and dirty laundry and not knowing which is which. This can lead to having to wash clothes more often – not very environmentally friendly. Save on the washing by keeping your clean clothes separate from your laundry in packing cubes. It sounds so simple but it will save you time and money as well as keeping your travelling impact on the environment to a minimum. Additionally, you can get folders, which allows you to fold dresses, collared shirts, and slacks in a folder, then stack them, and place the folding board on top to secure. And viola! You’re looking sharp. This simple solution is an easy fix to stop your nice clothes from falling all over each other inside your luggage. You may be tempted to separate your dirty clothing, toiletries or other items in plastic bags, only to discard them once you have used them. This kind of usage of plastic bags causes so much plastic waste and it is becoming an increasingly prevalent environmental problem. Using packing cubes to separate your luggage and re-using them means you reduce the number of plastic bags used. You should also think about using alternatives to using plastic bags in other areas. 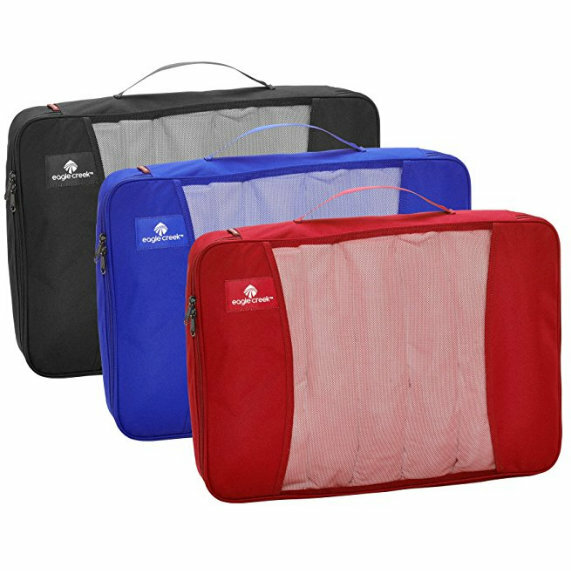 Many travellers will ask why they should fork out buying travel packing cubes when they can use zip lock bags. Well Zip lock bags are made with plastic, so are not environmentally friendly. Although they can be reused, they tend to tear and break easily meaning they must be replaced. Fabric packing cubes are much more versatile and very durable as they are built to last. 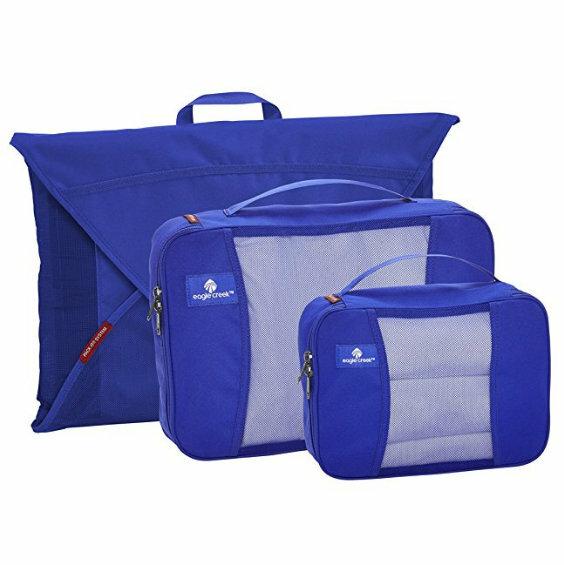 With prices starting from around $15, and increasing from there if you purchase a set, packing cubes are a cheap addition to your travel necessities. Prices do vary depending on the quality, number of cubes and sizing but you can get some good deals if you look in the right place. The great thing is it’s a one-off payment too so once you’ve purchased them, they will last a long time. ➡ They can separate family clothing in one case. If you buy different colored cubes for each member of the family, you can grab your stuff easily without getting things mixed up. Great if you are travelling with limited luggage. ➡ A packing cube filled with clothing can make a comfortable alternative to a neck pillow on a long flight. ➡ In flight organisation, quick access to what you need without having to dig through a large bag. 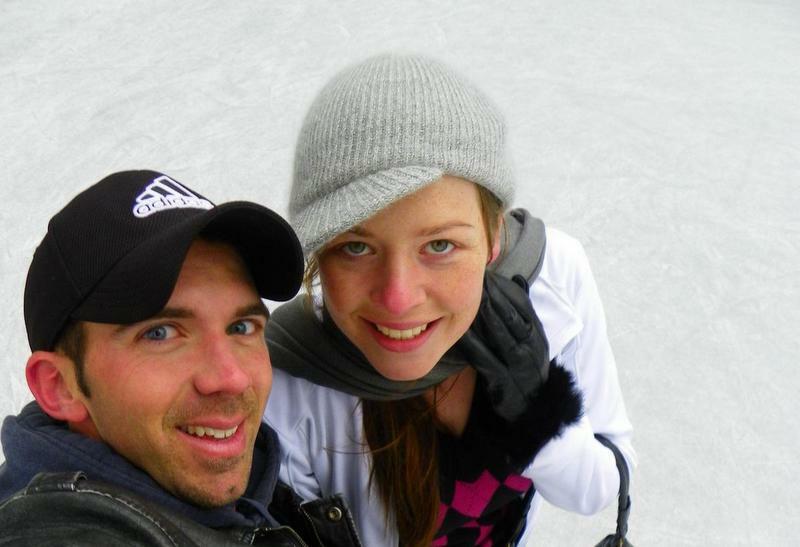 When he is not immersing himself in new cultures, meeting new people, and tasting new foods, John Miller loves writing and learning new languages. Head on over to his blog, pretravels.com, and follow him on Facebook and Twitter! i always roll my clothes when i traveled, i must try this one too. Rolling is a great packing strategy – you’ll love packing cubes too! You know, just a couple of weeks ago I was looking at these packing cubes and thought I should look into them. Honestly I did not have a clue what their purpose was. After reading this article, I am definitely going to buy a set and get rid of the plastic bags I used all the time on my trips. I’m glad we could explain their purpose for you – I seriously love them, when I’m not traveling I use them to keep my wardorbe organized, and it’s so nice being able to ditch the plastic bags knowing how harmful they are to the environment. Now that I read your article I remember once again how bad I am at packing. My clothes always mix up with the dirty cloth and because I also want to be environment friendly I don’t use any plastic bags. I had no idea about this cool alternative will definitly check out these packing cubes. Also like you said: perfect for inflight organisation. I have been using Packing cubes for years now and really, I can’t travel without it. It’s very useful and it keeps things organized. I could never have enough of it. 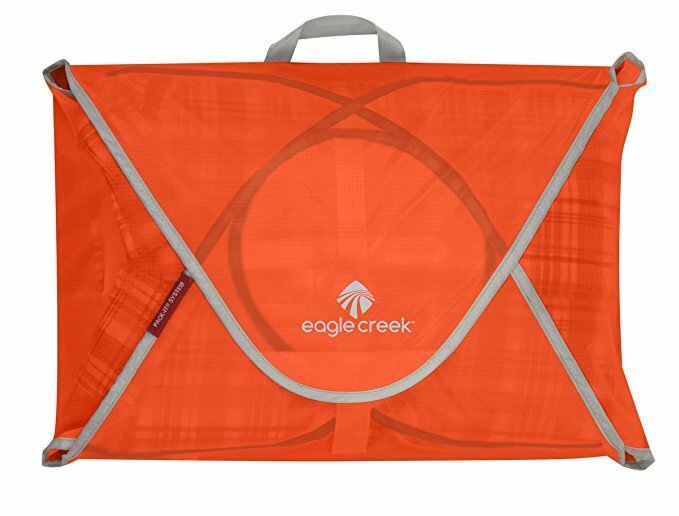 I use Eagle Creek packing cubes, but have never thought of them as specifically environmentally friendly. However, after reading your post, I see it. I have reduced the amount of plastic bags I use when traveling. Awesome Paige! Glad to hear you’re already a fan, and now you have the added bonus of feeling great for doing your bit for the environment too :) Happy travels! I’ve been meaning to get myself some packing cubes – so you’re preaching to the choir here ;) – but now I’m thinking about folders too. I need this more than ever now as these days I tend to travel around using a backpack rather than a trolley bag. We have not yet used the cubes, but have read about it. They look like a pretty decent and organized way to pack. One of the most important advantages is that it becomes so easy to retrieve exactly what is needed instead of rummaging through your luggage.That a cube with clothes can double up as a pillow is oh so convenient! Absolutely – they’re such a great way to keep your luggage organized, I’ve become so obsessed that when we’re not traveling I actually use them in my wardrobe too :D Such a brilliant organization tool. I’m absolutely a proponent of packing cubes. They’re the one thing that keeps my life organized while I travel. This is an interesting approach to using them too. Never thought of it like that. Excellent information- thank you for sharing! I’m a late adopter and wish I had discovered packing cubes sooner. Apart from being eco-friendly and stylish, the multi-coloured cubes are the perfect way to organize my kids clothes. Thanks Nancy, glad you enjoyed the post! They’re one of those things where once you have them, you wonder why you didn’t discover them sooner! Makes life so much easier! 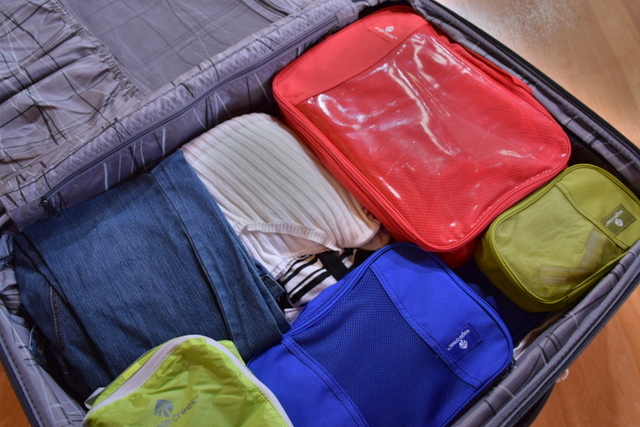 Especially for family travel, as you’ve discovered re color coding packing for your kids. So easy! Thanks for the tips Meg, the first set I bought were terrible quality and one zip broke and another seperated at the seam on the first trip so I’ve been meaning to get some more and try again. I love my bag to be organised and the compression is a big help too. Will take a look at these brands. Thanks a lot fro sharing this amazing post with us! 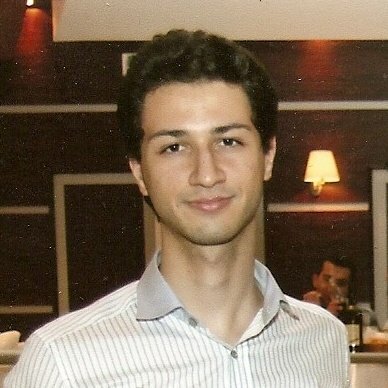 Second time reading your post and sharing this with my friends and family ! Appreciate the share. Happy travels! 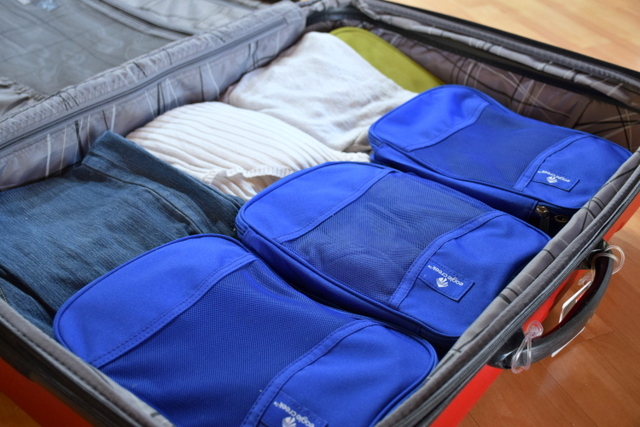 Absolutely nothing is as effective at keeping your luggage organized as packing cubes. Once you start using them you’ll wonder why you didn’t discovered them earlier. Totally agree with you! And yes, that was exactly the case – once I started using them I wondered where they had been my whole life :D! I love packing cubes. It wouldn’t occur to me to use plastic bags if I didn’t, though. I’d just put the stuff in the suitcase loose. I’m now trying to teach my mother to actually use the cubes she bought last year.